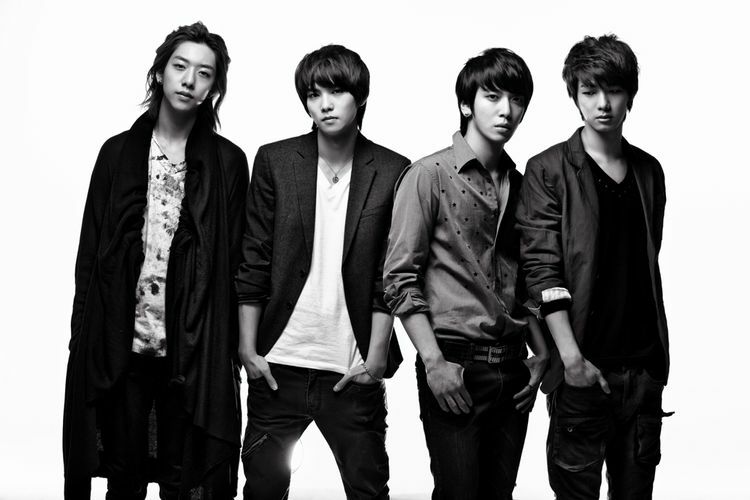 CN Blue (Korean: 씨엔블루, Japanese: シーエヌブルー; stylized as CNBLUE), is a South Korean rock band formed in Seoul in 2009. The band consists of Jung Yong-hwa (lead vocals, rhythm guitar), Lee Jong-hyun (lead guitar, vocals), Lee Jung Shin (bass guitar, vocals) and Kang Min-hyuk (drums, vocals). CN is an abbreviation of ‘Code Name’ while BLUE is an abbreviation of the members’ individual images. ‘Burning’ represents Lee Jong-hyun, ‘Lovely’ represents Kang Min-hyuk, ‘Untouchable’ represents Lee Jung Shin, and ‘Emotional’ represents Jung Yong-hwa. Debuted on August 19, 2009 in Japan with the band's first mini album, Now or Never. The group released four teasers for their 1st Korean mini album Bluetory, starring one member per each of the videos in the sequence of Jonghyun, Minhyuk, Jungshin and lastly, Yonghwa on the 6th, 8th, 11 and 13 January 2010 respectively.